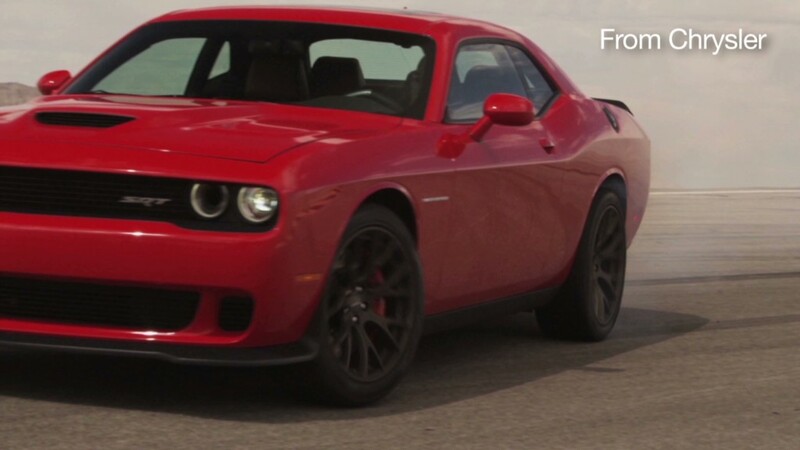 Even though it's being called the "most powerful muscle car ever," the Dodge Challenger SRT Hellcat is not the biggest gas guzzler out there. The car can get an EPA rated 22 miles per gallon on the highway, the automaker announced Wednesday. Chrysler Group unveiled the car in July. With the optional Hellcat engine, it can put out a total of 707 horsepower. It is so powerful that it comes with two separate key fobs to start the car. A red one will enable the driver to use the Hellcat's full power potential while drivers given the black key fob will only be able to unleash up to 500 horsepower. Even with the black key, the Hellcat will still have more power than the next most powerful Challenger model which will have a 485 horsepower engine. To be sure, 22 mpg is not exactly fuel efficient by today's standards. But newer muscle cars are getting better gas mileage and the Challenger SRT Hellcat's mpg is comparable to cars that have lower horsepower. The Chevrolet Corvette Z06 puts out 650 horsepower and gets 29 miles per gallon on the highway, according to the U.S. Department of Energy. The 2015 Chevrolet Camaro gets 18 miles per gallon and can put out 420 horsepower. The Lamborghini Aventador Roadster puts out 700 horsepower and gets 18 miles per gallon. But at $425,845, it's much more expensive than the Challenger SRT Hellcat, which starts at $59,995.